Riders in 2017 enjoying the community spirit of riding from Tathra to Bega. In 2018, the ride happens in reverse. Photo: Dave Gallen. 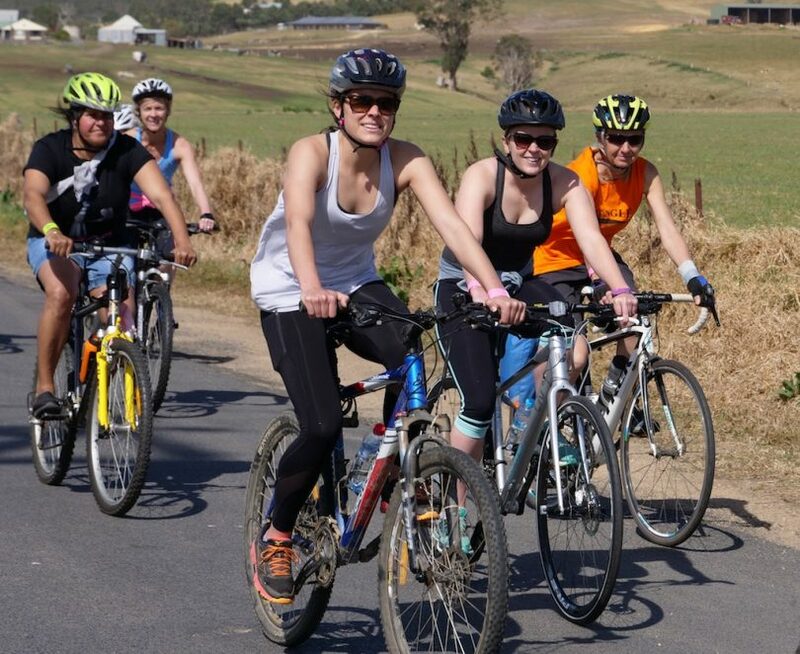 Canberra cyclists are invited to join a community ride through the farmland that rolls towards the coast from Bega to Tathra. 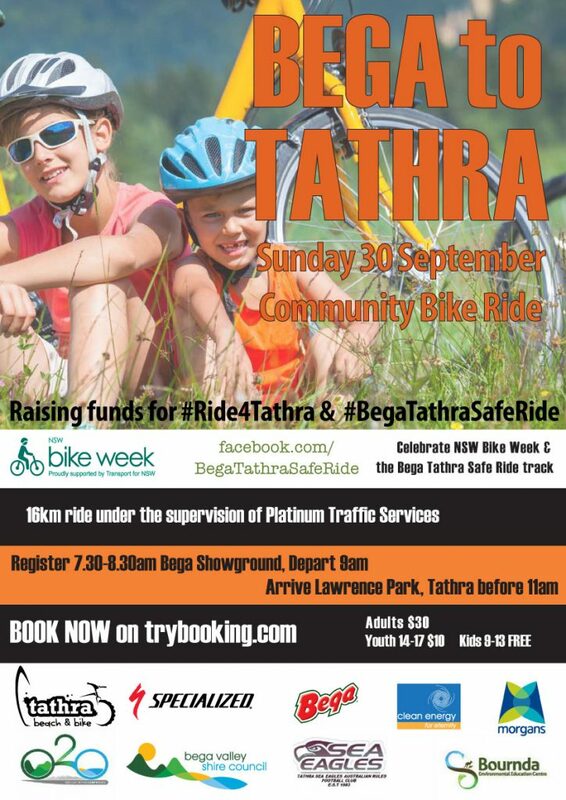 Leaving Bega Showground at 9 am on Sunday, September 30, the Bega Tathra Safe Ride – NSW Bike Week Community Ride, will head for Lawrence Park Tathra. The inaugural ride 12 months ago saw around 270 riders of all abilities peddle the 16km between the two towns, experiencing what the local community hopes will soon be a dedicated bike track linking coast and country landscapes. The long-held dream of a dedicated bike track linking Bega and Tathra is becoming a reality, with planning for stage one well advanced. 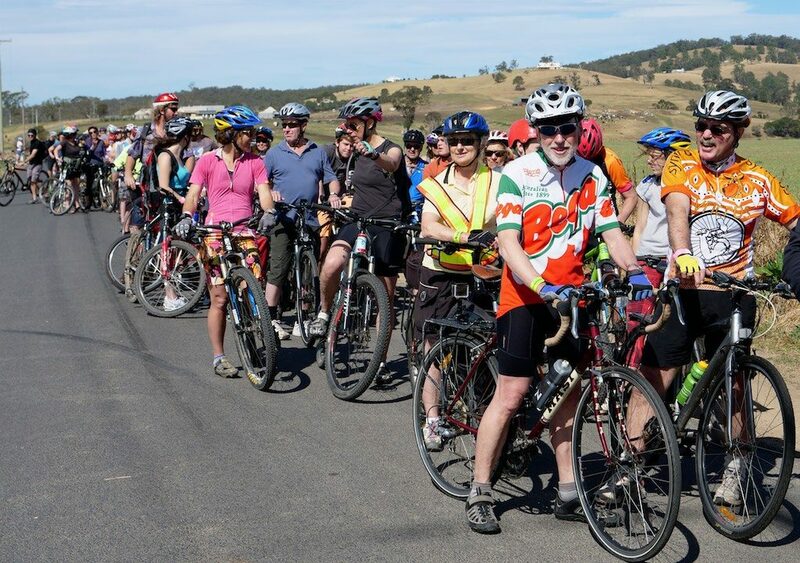 “We’ve been talking about this for a long time so seeing the first 4.6 km from Tathra to Kalaru starting to take shape is very exciting, but we need to keep fundraising and the community ride is part of that effort,” says Robert Hartemink, ‘Lead Rider’ of the Bega Tathra Safe Ride Committee. The NSW Government has so far invested $3 million into the project which is being managed by Bega Valley Shire Council. On September 30, riders will get a sense of the full vision and its potential for the Bega Valley community and tourism. The smiles of 2017 will be repeated on September 30 this year. Photo: Dave Gallen. “Rolling road closures managed by Platinum Traffic Services will give riders a chance to experience the journey without the normal pressure of traffic,” Robert says. “This will be a great family day. Only the brave and keenest of riders can tackle this course normally, the speed and the closeness of cars and trucks is just too much for most. Entry fees from the ride will help with the ongoing fundraising effort to extend the track all the way to Bega. Funds from the day will also be allocated to the Mayor’s Tathra and District Bushfire Appeal. “Families who lost their home in the fires of March 18 get to ride free, we know that many people are still struggling with their grief and the task ahead, we really hope this is a day that will lift them up and push them forward,” Robert says. On the back of last year’s success, entries are now open and the number of riders is starting to build as word spreads. The farmland between Bega and Tathra provides a great backdrop to the Community Bike Ride. Photo: Dave Gallen. Riders are expected to arrive at the Tathra finish line before 11 am, and the event will conclude at 11:30 am after the Lucky Rider Prize is drawn. Tathra Beach & Bike have chipped in with a $500 voucher for the purchase of ‘Specialized’ gear from their store. All riders will be in the draw for that fantastic prize. There’s more information on the Event Website and Bega Tathra Safe Ride Facebook page including a link to TryBooking.com for registrations ahead of the day.